Only a couple of days left before Christmas and I’m busy wrapping up a few more posts to put them under the tree. This one is another favorite of mine. 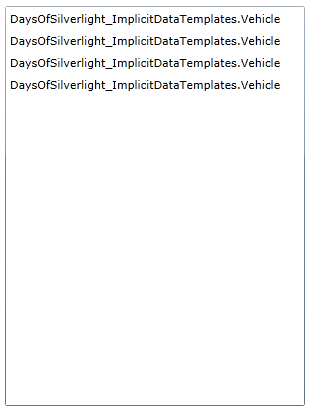 On the ninth day of Silverlight, the team delivered to me… implicit data templates. Prior to Silverlight 4, all styles and data templates were explicit. This meant that every time you referenced one you had to do so by the key name. Silverlight 4 introduced implicit styles where you could use the new property TargetType to set the default style of a control. This was a monumental leap in component reusability and style management. Silverlight 5 introduced the next piece by providing implicit data templates. The best way to really discuss implicit data templates and their benefits is to walk thru it. Now will we create a simple ListBox to display some data. The last step is to create some data in our code behind and set the ListBox’s ItemsSource property to it. 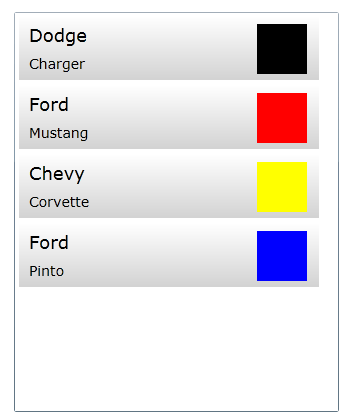 Now if you run the example, you will get a list of items that have the full name of our Vehicle class. Not exactly a world class list box is it? So now let’s see a data template in action. We will create a DataTemplate on our page and assign the ListBox’s ItemTemplate property to it. You might notice I had to add a value converter in there. The converter takes a Color and returns a SolidColorBrush. Here is that value converter. Now running our application will yield a bit more information than last time. Running the application you will notice that is looks identical to the last run. Just for completion, you can change the ListBox to a ComboBox and will see that the same template is being used. Next we will update our code that is creating our collection set to use our new objects. 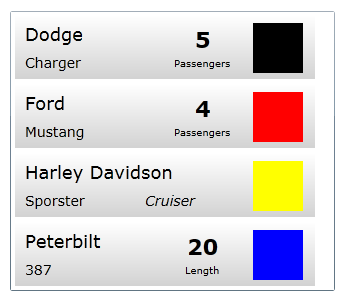 You might notice we kept the original Vehicle list since all of our objects inherit for the Vehicle class. Now if we run our application, you will notice that nothing has changed. That is because we are still using our Vehicle template. However, with our new classes, maybe we would like to display different data based on the type of class. For instance, maybe we can show the number of passengers a car can hold or the length of trailer a truck has. In SL4 you could accomplish this by creating a custom content control and define the content based off of the class (a neat little trick I picked up from the PivotViewer team). Now it is as simple as defining multiple data templates. So let’s add a few more data templates to our UserControl’s resources. Running our application now gives us unique displays for each type of class. A thing to note is that this will still run if you keep the original Vehicle data template in there. This is helpful when only some of the inherited classes need to have generic interfaces. You can create an interface for the base class and use it as a fallback. From here, it is possible to take things a step further. You can begin to create UI’s that are very dynamic and driven off of data templates. For instance, you can have generic master/detail screens that the UI is defined by the binding data type. Pretty slick stuff if you ask me and I will dig into more of that at a later date. Is it only for ItemsControl derived controls that has an “ItemTemplate” property, or cant it be used for any control that needs a data template? Specifically, is possible with DataForm control that has “EditTemplate” and “ReadOnlyTemplate” data templates? It works for all uses of data templates. I think xml elements doesn’t show here. I changed ListBox element with a DataForm element in your example, but failed.